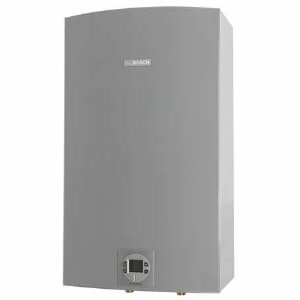 How to troubleshoot the problem when the temperature fluctuates in tankless water heaters when hot water temperature is changing during the shower from hot to cold and hot again? What is the "cold water sandwich"? Temperature fluctuation, also known as cold water sandwich refers to a situation when delivered water from a tankless water heater is hot for the first few minutes, then it changes to cold and back to warm / hot again. This is a very unpleasant situation for the users, especially when taking a shower. Unless the unit has special features that can minimize this fluctuation, tankless products, especially electric-powered, are subject to this temperature variation. When the heater is ON it provides hot water, while when the tap is closed, the unit turns OFF, so water inside the pipes gets cooled. The unit turns ON again and before hot water reaches the fixture, cooler water which is already in the pipes or went through the heat exchanger without being heated, is pushed out, resulting in the burst of cold water. 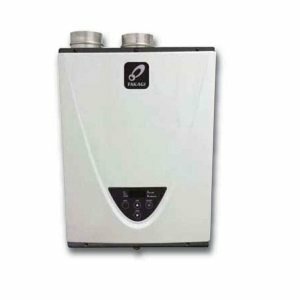 When looking at the manual of any tankless water heater, it can be noticed that the manufacturers recommend to the owners to keep the temperature of the hot water around 120 F as the safe temperature. This is the default setting. The minimum temperature is around 100 F while the maximum is around 140 F for homes or 180 F when used in commercial applications. One of the main reasons why the temperature fluctuates is that your tankless heater stopped working due to the low water pressure. The flow within your tankless unit is low, actually below the activation flow rate, resulting in shutting down the gas burner. If your heater has a standing pilot, the pilot light does not go out, only the main gas burner. Check for the manual to see the minimum required flow rate - it is usually around 0.4-0.5. Check out the article why my pilot light goes out, to see why your tankless heater shuts down and causes a sudden drop in the outlet "hot" water temperature. If your heating system is not designed properly where your tankless heater capacity is smaller than demand, and if additional fixtures in your home are opened or closed, there will be a change in the flow, and you will see the fluctuation or temperature drop. The end result is what will be the uncomfortable shower and the cold water coming out of your shower-head. Another reason why water temperature fluctuates is the restriction in the hot water flow. What you can do is checking the plumbing fixtures, faucet aerators, and shower-heads, as they might be clogged due to the mineral deposits. Flush and clean every single one, or if damaged use the new units. To clean and flush the fixtures, the recommendation is to soak them in the vinegar to break and dissolve mineral deposits... flushing with the water after. Some tankless heaters, like older Bosch 125 series, for example, are equipped with the flow control knob setting which allows you to control the activation rate. If you set it to the lowest, the temperature of the water will be the highest. New modern tankless units, such as the Navien NPE-A series are equipped with the small buffer tank, which eliminates the need for the minimum water flow. 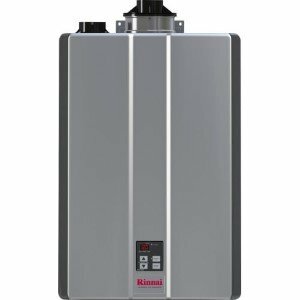 Another good example is the model RTG-199HE from Rheem Infinity series that is equipped with the automatic bypass system with the water adjustment valve, a modulating system that ensures excellent temperature stability and consistent outlet temperature throughout the draw. These are some of the examples of how manufacturers are dealing with the temperature fluctuation and cold water sandwich issues. If your tankless unit is equipped with the inlet filter screen, it might be dirty, so water cannot pass through, and the flow is below desired. The filter can be found at the bottom of the unit, simply remove it and clean it. If it is necessary, replace it. The problem in the plumbing can also be the reason for an inadequate flow which is why tankless water temperature fluctuates, hot-cold-hot. One of them is the plumbing crossover; caused by the faulty mixing valve, incorrect plumbing or if you have a single lever faucet, failed washer. Check all the faucets. Close the main valve, open the hot water tap, wait for 5 min, and if the water is still running, you have a problem with plumbing crossover. Water pressure has to be according to the manufacturer specs. The constant pressure of 30 psi has to be maintained, even if using other sources of water, like well, for example. Check that the mixing valve is installed, as it lowers the temperature of hot water by mixing it with the cold... check the set temperature on the valve. Before you do any changes on your plumbing system or trying to fix the temperature fluctuation problem on your heater, it is suggested to check the activation flow rate problem first. Measure the fill time to see what is the proper activation rate. If the fill time is longer than usual (when you are not experiencing changes in temperatures) the odds are, the activation rate is not met. Check if the circulation pump is operating correctly. If not, buy a new quality one, such as this Grundfos. Check if there any air inside the system as it can affect the proper operation of the pump. As the minimum flow is required, check the pump sizing that it is not undersized. Make sure that the checking valve is adequately installed and between the pump discharge and connection to the cold water supply. If the above problems and actions look too complicate to solve the problem with the cold-water-sandwiching, hire a professional.